Dr. Worm notes that the recently-updated Red List issued by the International Union for the Conservation of Nature assessed 59,508 species, of which 19,625 are classified as threatened. This means the IUCN Red List, the most sophisticated ongoing study of its kind, monitors less than 1% of world species. The research is published alongside a commentary by Lord Robert May of Oxford, past-president of the UK's Royal Society, who praises the researchers' "imaginative new approach." "It is a remarkable testament to humanity's narcissism that we know the number of books in the US Library of Congress on 1 February 2011 was 22,194,656, but cannot tell you -- to within an order-of-magnitude -- how many distinct species of plants and animals we share our world with," Lord May writes. "(W)e increasingly recognize that such knowledge is important for full understanding of the ecological and evolutionary processes which created, and which are struggling to maintain, the diverse biological riches we are heir to. Such biodiversity is much more than beauty and wonder, important though that is. It also underpins ecosystem services that -- although not counted in conventional GDP -- humanity is dependent upon." Swedish scientist Carl Linnaeus created and published in 1758 the system still used to formally name and describe species. In the 253 years since, about 1.25 million species -- roughly 1 million on land and 250,000 in the oceans -- have been described and entered into central databases (roughly 700,000 more are thought to have been described but have yet to reach the central databases). To now, the best approximation of Earth's species total was based on the educated guesses and opinions of experts, who variously pegged the figure in a range from 3 to 100 million -- wildly differing numbers questioned because there is no way to validate them. Drs. Mora and Worm, together with Dalhousie colleagues Derek P. Tittensor, Sina Adl and Alastair G.B. Simpson, refined the estimated species total to 8.7 million by identifying numerical patterns within the taxonomic classification system (which groups forms of life in a pyramid-like hierarchy, ranked upwards from species to genus, family, order, class, phylum, kingdom and domain). Analyzing the taxonomic clustering of the 1.2 million species today in the Catalogue of Life and the World Register of Marine Species, the researchers discovered reliable numerical relationships between the more complete higher taxonomic levels and the species level. Says Dr. Adl: "We discovered that, using numbers from the higher taxonomic groups, we can predict the number of species. The approach accurately predicted the number of species in several well-studied groups such as mammals, fishes and birds, providing confidence in the method." 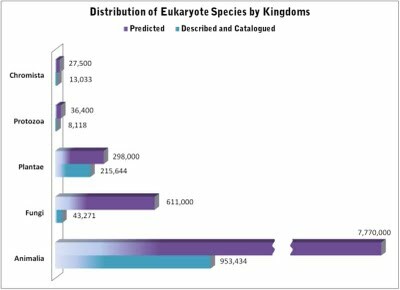 Total: 8.74 million eukaryote species on Earth. Within the 8.74 million total is an estimated 2.2 million (plus or minus 180,000) marine species of all kinds, about 250,000 (11%) of which have been described and catalogued. When it formally concluded in October 2010, the Census of Marine Life offered a conservative estimate of 1 million+ species in the seas. "Like astronomers, marine scientists are using sophisticated new tools and techniques to peer into places never seen before," says Australian Ian Poiner, Chair of the Census' Scientific Steering Committee. "During the 10-year Census, hundreds of marine explorers had the unique human experience and privilege of encountering and naming animals new to science. We may clearly enjoy the Age of Discovery for many years to come." "The immense effort entering all known species in taxonomic databases such as the Catalogue of Life and the World Register of Marine Species makes our analysis possible," says co-author Derek Tittensor, who also works with Microsoft Research and the UN Environment Programme's World Conservation Monitoring Centre. "As these databases grow and improve, our method can be refined and updated to provide an even more precise estimate." "We have only begun to uncover the tremendous variety of life around us," says co-author Alastair Simpson. "The richest environments for prospecting new species are thought to be coral reefs, seafloor mud and moist tropical soils. But smaller life forms are not well known anywhere. Some unknown species are living in our own backyards -- literally." "Awaiting our discovery are a half million fungi and moulds whose relatives gave humanity bread and cheese," says Jesse Ausubel, Vice-President of the Alfred P. Sloan Foundation and co-founder of the Census of Marine Life. "For species discovery, the 21st century may be a fungal century!" Mr. Ausubel notes the enigma of why so much diversity exists, saying the answer may lie in the notions that nature fills every niche, and that rare species are poised to benefit from a change of conditions. In his analysis, Lord May says the practical benefits of taxonomic discovery are many, citing the development in the 1970s of a new strain of rice based on a cross between conventional species and one discovered in the wild. The result: 30% more grain yield, followed by efforts ever since to protect all wild varieties of rice, "which obviously can only be done if we have the appropriate taxonomic knowledge." "Given the looming problems of feeding a still-growing world population, the potential benefits of ramping up such exploration are clear." Based on current costs and requirements, the study suggests that describing all remaining species using traditional approaches could require up to 1,200 years of work by more than 300,000 taxonomists at an approximate cost of $US 364 billion. Fortunately, new techniques such as DNA barcoding are radically reducing the cost and time involved in new species identification. Concludes Dr. Mora: "With the clock of extinction now ticking faster for many species, I believe speeding the inventory of Earth's species merits high scientific and societal priority. Renewed interest in further exploration and taxonomy could allow us to fully answer this most basic question: What lives on Earth?"